'I think he's a remarkable talent … on the Bill Clinton, Barack Obama scale,' says one admirer of New Orleans Mayor Mitch Landrieu. 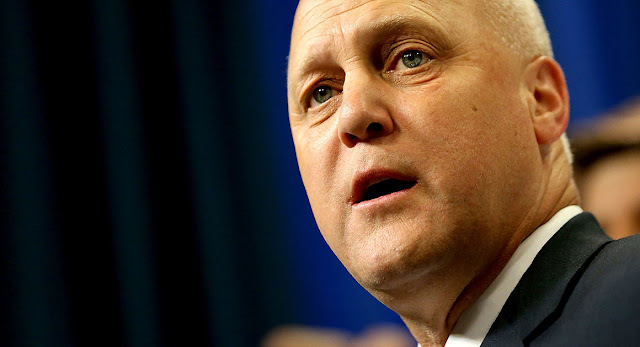 Mitch Landrieu isn't, for the moment, getting ready to run for president. But that's not stopping the Democrat who led the rebuilding of New Orleans from speaking out against institutional racism and what he calls the "nightmare loop" that links Donald Trump to David Duke. With a media tour for his new book, "In the Shadow of Statues" (out Tuesday), and after headlining this month's media-fest Gridiron Dinner in Washington, Landrieu knows he's kept people talking. Monday night on "The Daily Show," he smiled through a long burst of applause when Trevor Noah pitched him on 2020. Ridiculous as he and everyone around him knows it is to think about a New Orleans mayor making a serious bid for the White House, they also see the unique profile he'd have in a huge Democratic field concentrated on the coasts — the white Southern liberal who loves wrestling and musical theater, and looks like he could blend right in at a Trump rally. Barack Obama has taken note of Landrieu's record as mayor and a speech he gave last year on removing Confederate monuments. The former president has said privately that he could see the appeal of a bald white guy from Louisiana talking up progressive politics in a smooth Southern accent. Though Obama is far from signing up, some notable players in his orbit are daydreaming of finding the next unlikely superstar and making it happen. Landrieu sees the situation. He says he just doesn't necessarily see himself as the solution. "The country's in a dark hour. My commitment has always been to do what I can to help," Landrieu said. "You never say never. At the moment, I can't see a pathway." And he knows he's laying out what sounds like a platform. The subtitle of his book, a frank account of racism in America, is "A White Southerner Confronts History." It includes tough words about the failures of politics to stop discrimination. In one passage, Landrieu points out that on the campaign trail, Ronald Reagan condemned the murders of civil rights workers, but that he then approved a budget that served pickled relish as a vegetable in poorer public schools. He also knows, according to a person close to him, that running statewide in red Louisiana would likely be impossible after some of the decisions he's made and constituencies he's catered to as a strongly Democratic mayor. Also that his father, former New Orleans Mayor Moon Landrieu, sometimes regrets not having run for president himself. Landrieu hasn't raised money or hired any consultants or conspicuously campaign-minded aides. But he does have his prominent cheerleaders with local roots, like Louisiana native and former interim Democratic National Committee chair Donna Brazile, who said he'd be "a fantastic candidate." "We all know had Hillary Clinton won, Mitch Landrieu would have been a candidate for several Cabinet appointments," Brazile said, stressing that she wasn't making an endorsement. "But given the circumstances, I think it's important to keep his eyes open and see which way the wind will blow in 2020." "It's one thing to run for president, and it's another thing for people to take you seriously. He clearly falls into the second category," said James Carville, the Clinton political guru. "I think he's a remarkable talent ... on the Bill Clinton, Barack Obama scale. The more people see him, the more people will like him." "I think he could have a really strong appeal as somebody who would run entirely outside of the Washington, D.C., ecosystem, and I think there's a real hunger for that among Democrats. He fits that bill, and others do as well," said Mitch Stewart, Obama's Iowa field director in 2008 and battleground states director in 2012. "In a field of 15 to 20 candidates, in the first couple of states, you don't need to get 50 percent. Can your posture, can your values as a candidate — would 15 to 20 percent be enough to prove viability? The calculus is different than in 2008 and 2016." Stewart added, "He would be one of the few candidates who I think could appeal to the African-American community and the white working class." In 2010, after moving his family back to New Orleans and feeling distraught at the state of the city, Carville talked Landrieu into a late entry into the mayor's race with a poll that showed he'd win easily, despite his three previous losses for the job. Carville said he'll try to be that convincing again. "I'll do my best, because I'd like to see him run," he said. Landrieu's book tour is taking him all around the country, ahead of an enormous tricentennial bash in New Orleans just before his term ends in May. "I think people in the country are thirsting for an answer for how we get out of where we are and get us to where we need to be," Landrieu said. "This has less to do with me, than can we please find somebody to really run the country … to get us out of this seemingly manufactured chaos that we're in and get us to some security." He contrasted Trump's record with his own experience leading a city devastated by Hurricane Katrina and wracked by years of mismanagement that's now on the rise. New Orleans, Landrieu said, is "a city that is ascendant that used to be descendant." Landrieu is spending his final year as mayor serving as president of the U.S. Conference of Mayors, traveling the country as he leads a bipartisan rejection of the Trump administration's policies on infrastructure, immigration, health care and more. He said Washington needs to pay closer attention to the performance of mayors from both parties. "The question we have to ask ourselves is why Washington is so stuck when you have all of this innovation going on," Landrieu said. But Landrieu's big mission, and one that he said he doesn't need to run for president to pursue, is making people confront racism — their own and the country's. That starts with Trump but goes much deeper, he said. Everything that America is going through now, he said, Louisiana has seen already. "We can recognize it more clearly, and we hear dog whistles more acutely. I was trying to wake the country up to the fact this is not new," Landrieu said. In the book, Landrieu traces Duke's rise through state politics in the 1980s and 1990s — the two served alongside one another in the statehouse in Baton Rouge. Landrieu writes that Duke advanced by tapping into economic anxiety and got a pass on his racism from other Republicans who "saw him as a slick operator of calculated expediency, but very few wanted to speak out against him." The former Klansman, Landrieu writes, was regularly undercutting facts in an early version of "fake news!" A passage from a newsletter from Duke's National Association for the Advancement of White People, Landrieu writes, "sounded a whole lot like 'Make America Great Again.'" "It seems so benign, but the word again gave the line its punch. Again fills African-Americans with dread. Exactly when were we great before? What are we going back to? And by the way, your great wasn't so great for me," Landrieu writes. Landrieu said he's going to take some time when his term ends to recover. He's been in office for 30 years straight, working his way up. He has five children, and he said he wants to earn a living. The last section of his book makes a more direct case against Trump, weaving in his own personal history and quoting Robert F. Kennedy. "Poverty is a form of violence, I believe. So is not having access to health care, or not having a real job," Landrieu writes. "We all come to the table of democracy in the United States as equals. That's what makes America great." If Landrieu decides to run, he'll have the rare luxury of not having a job — either to distract him from the campaign or to trigger complaints that he's ignoring his work for the sake of his political ambitions. His admirers say Landrieu's background also gives him the advantage of being able to speak credibly to Trump voters. "If he showed up somewhere, people would show up to hear what he has to say," Carville said. "That's a huge thing. Not everybody crosses that threshold from Day One." Correction: An earlier version of this story and headline incorrectly described Landrieu as Cajun.